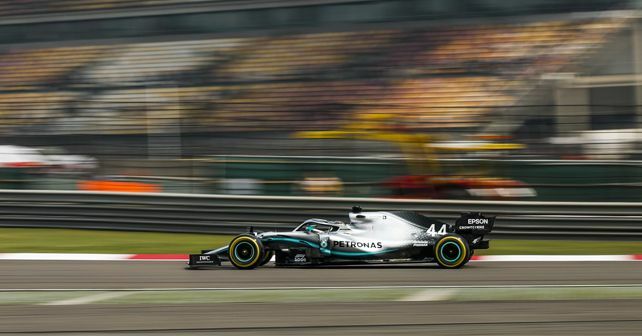 Lewis Hamilton took his second win of the 2019 season as he cruised to victory in the Chinese Grand Prix. Valtteri Bottas took the second spot to make it another Mercedes 1-2 finish. Sebastian Vettel finished in third, taking Ferrari's first podium finish of the season. Mercedes-AMG F1 took another crushing 1-2 finish as Lewis Hamilton won the Chinese Grand Prix, ahead of teammate Valtteri Bottas. Arch-rival Scuderia Ferrari couldn’t hold a candle to Mercedes’ pace at the Shanghai circuit, but Sebastian Vettel managed to take the third spot behind the Mercedes duo. The start of the race saw Hamilton get a better start from second on the grid as he passed the pole-man Bottas. Similarly, at Ferrari, it was Charles Leclerc – P4 in qualifying – who passed teammate Vettel to take the third spot right in turn 1 of the first lap. The following laps saw the Mercedes pair pull away, while Ferraris started to fall behind. However, while Leclerc was in front of Vettel, it was the latter who was quicker of the two Ferraris, and was always within a second of his teammate. This prompted Ferrari to give out team orders, and Leclerc was asked to let his teammate by. On lap 11, Leclerc did so. However, Vettel couldn’t really pull away from his teammate and both the drivers had more or less the same pace. But, because Vettel was in front, Ferrari pitted him early on in lap 18 and put Leclerc on a long run strategy. This meant Leclerc stayed out for five more laps and his race was compromised. When he came out from the pits, he even lost the fourth position to Red Bull’s Max Verstappen! At the front, Mercedes was comfortably ahead of Ferrari as their drivers ran a flawless race to take a third consecutive 1-2 finish of the season. Hamilton was in a class of his own though and finished the race 5 seconds clear of Bottas. Vettel’s third-place finish meant Ferrari stepped on the podium for the first time this year. Verstappen took the fourth place, despite facing a late charge from Leclerc. Pierre Gasly of Red Bull Racing came home in sixth - his best finish in this season so far. Daniel Ricciardo picked his first points with Renault in seventh. Sergio Perez of Racing Points was ninth, as he fended off Alfa Romeo’s Kimi Raikkonen in the closing stages of the race. Alexander Albon of Toro Rosso finished the race in tenth and it was an absolutely magnificent performance, since he started the race from the pit lane, following a chassis change after having a horrible crash in a practice session on Friday. He was also voted the driver of the day, and deservedly so. After three races, Hamilton (68) now leads the driver’s championship from teammate Bottas (62). Verstappen is in third with 39 points.